US President Donald Trump has condemned the killing of dozens of civilians in northern Syria in an apparent chemical weapons attack by Syria’s air force. He did not mention Russia, Syria’s ally, which says chemical weapons in rebel hands may have been released. But America’s envoy to the UN accused Russia of covering up for Damascus. 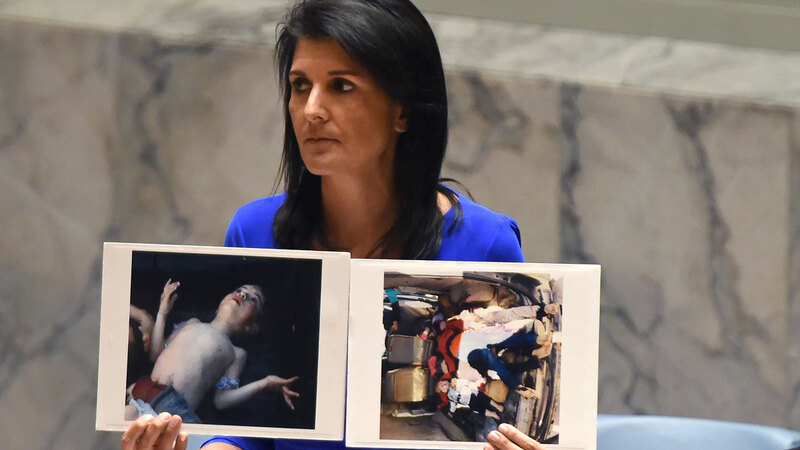 “Time and time again Russia uses the same false narrative to deflect attention from their ally in Damascus,” Nikki Haley said during a heated UN Security Council debate in New York. Both the World Health Organisation and medical charity MSF said some of the victims had symptoms consistent with exposure to nerve agents. Will there be a change in US policy? US Secretary of State Rex Tillerson called on Russia to “think carefully” about its continued support for President Assad. Vice-President Mike Pence said “all options are on the table” regarding Syria. Only last week, Ms Haley said the US was no longer prioritising the removal of President Assad, a shift in US policy from the Obama era.